Widely ranked among the Phillies' top prospects by many outlets, righty hurler Adonis Medina has made a name for himself, as scouts rave about his skills, coaches boast about his potential and Phils' brass adores his ability. Medina, who is equipped with a mid-90's fastball along with a curveball and a change up that are considered to have plus potential, has used that arsenal to impress at the lower levels of the minor leagues to date. 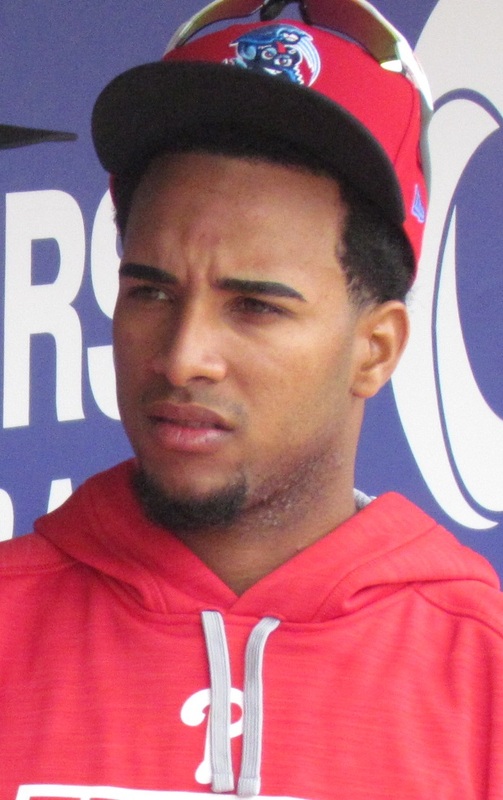 Signed in 2014 at age 17, Medina made his pro debut that year as part of the Phillies' Dominican Summer League team. In 11 games (two starts) he would post a 2-3 record with a save, a 1.27 ERA and a 7.5 K/9 mark along with a .220 batting average against. In 2015, the six-foot-one 187-pounder competed with the rookie level Gulf Coast League Phils, sporting a 3-2 record with a 2.98 ERA, a .253 BAA and a 6.9 K/9 mark in 10 games (eight starts). The following season, at the age of 19, he would pitch with the short-season Class A Williamsport Crosscutters and was the team's opening day starter. In 13 games, all starts, Medina tallied a 5-3 record with a 2.92 ERA along with a 4.7 K/9 mark. In 2017 Medina would join the Class A Lakewood BlueClaws. In 22 starts he would put together a 4-9 record with a 3.01 ERA, a .227 BAA along with a 10.0 K/9 mark (3rd best in the league). Last season, taking the step up to Class A Advanced Clearwater, Medina sported a 10-4 record with a 4.12 ERA, a .245 batting average against along with a 10.0 K/9 mark in 22 outings (21 starts). He was highly successful at home for the Threshers, notching a 2.86 ERA and .226 BAA in 12 appearances at Spectrum Field, while he tallied a 5.96 ERA and .271 BAA in 10 away games. Medina is praised for having a great feel for pitching and a power arm. His fastball, which consistently gets to 95 MPH and touches higher, arrives at the plate featuring sink, helping to result in ground balls from the opposition. Additionally, both secondary pitches are strong. The Dominican Republic native already has the control of an elder pitcher, tossing loads of strikes with consistency in the strike zone, and coaches cite that he embraces the learning process. The Phillies added Medina to their 40-man roster over the off-season in order to protect him from the Rule 5 draft. He appeared in three big league spring training games this year, allowing two earned runs while striking out five and walking one in 4 2/3 innings. The 22-year-old's ceiling seems quite high, but Medina has plenty of development ahead to fulfill those expectations. Expect Medina to open the season as part of the starting rotation for Double-A Reading. Track this year's complete Phillies top 25 prospects countdown by clicking this link.